A new series of polling data from last week shows President Obama has significantly increased his lead over his republican challenger, Mitt Romney. The common analysis of The President’s significant five point bump in the polls is that it is a positive effect in wake of the successful DNC convention in Charlotte but many people are missing the negative effect the RNC Convention in Tampa had on Mitt Romney. The conventions in Tampa and Charlotte were showcases of the political parties’ platforms, assessments of the present policies and their ideas for the future. The Democrats showcased their ideas well but really showed nothing new from the path for the future the President has been on: Education and job training, saving the auto industry, a more focused and strategic foreign policy, women’s rights, etc. The Republicans on the other hand showcased their party’s lack of ideas that has become indicative of the Romney campaign. In the first night of the Democratic Convention President Obama’s name was mentioned 250 times compared to Mitt Romney’s name that was mentioned 213 times in all three nights of the Republican convention combined. The idea circulated that the Republican Party was disjointed during its convention because they are not totally united behind Romney, and that may be true, but another reason may be that they had no ideas and specifics to grab on to of Romney’s to promote and educate America on. Romney went into the convention suffering from lack of specifics and left more exposed as an incompetent policy maker. Mr. Romney’s plans for America have not been properly thought out. Take for instance his stance on Medicare, he would like to keep it the way it is for seniors age 55 and older, and then change the program to a premium support voucher. But in conjunction with his stand on repealing “Obamacare” Mr. Romney’s plans for Senior’s healthcare turns disastrous in the very near future. By repealing “Obamacare” and the $716 billion dollars in savings in the plan Mr. Romney shortens Medicare’s solvency by eight years. So if Mr. Romney gets his way Medicare will be bankrupt by 2016 meaning there is no possible way he can keep Medicare the way it is for seniors age 55 and older, he comes up six years short. 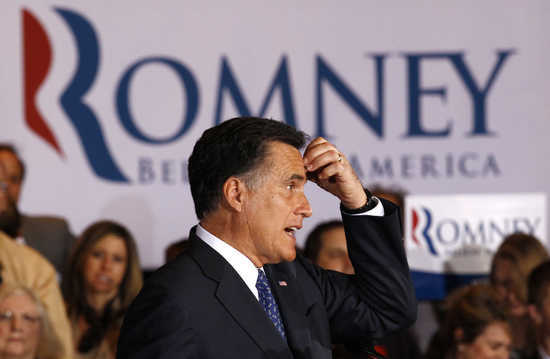 Another area Romney and his campaign failed to think through is his tax proposal. Romney would like to lower tax rates across the board for all tax payers and pay for it by eliminating “loopholes” in the tax code. The problem with this poorly thought out proposal is “loopholes” are deductions and credits many middle class Americans use to lower their tax burden. This was a damning critique of the Romney tax plan because the two possible scenarios under Romney’s thinking would either cause America’s total debt to grow by almost $3 trillion needlessly or raise taxes on middle class while cutting taxes for the wealthy. Moving from Romney’s vapidly inconsiderate plans for the future of America another area he came up empty on was the war in Afghanistan and the troops. Completely failing to mention Afghanistan or the troops in his acceptance speech during the Republican Convention begs the question, does Romney fully understand the job of President of the United States? Romney is slumping in the polls after the conventions but not because of anything the democrats did, it’s because Romney and his team haven’t been thinking through their policy proposals. They unwittingly have been promoting ideas that are detrimental to the middle class and the nation as a whole. The reason why Romney’s support in the polls has waned after the conventions is because his flawed ideas reached a larger audience. Perhaps calling Romney an empty chair isn’t fair, after all he does have plans, but the unfortunate thing is they are as poorly thought out as Clint Eastwood’s RNC speech. Michelle Obama showed in very real language President Obama’s empathy for hurting Americans and expressed his “common man” values compel his decision making. Bill Clinton gave a lights out rebuttal to the attacks against President Obama by his political foes. In an amazing display of mental jujitsu former President Clinton, now known as “The Secretary of Explaining Stuff”, dismantled Republican claims item by item in one of the most factually correct speeches given at either convention. All was going very well for Democrats. Point by point they were in lock step defending Medicare, advocating women’s rights, touting foreign policy, promoting education, and, of course, saving the American auto industry. The liberals found their voice; they were speaking to their base and beyond pushing their core belief that growth and prosperity comes from the middle class out and from the bottom up – that government can be a tool good. But when President Obama took the stage the energy flattened. Like leaving a darkened movie theatre after watching an exciting Hollywood production, the bright lights of the lobby tend to set in and minds leave the fantastical and adjust to the true light of reality. Obama was humble and gracious in his acceptance delivering a “workman” like speech more in the fashion of a stoic statesmen interested in checking off boxes rather than the fresh “A list” celebrity on the scene with a new catch phrase. Declaring that he’s “changed” The President remained steadfast and resolute in his progressive vision for the future. Invoking President Franklin Roosevelt as the standard for his re-election Obama warned, “if you turn away now… change will not happen.” Citing the possibilities of Medicare going bankrupt and being changed into a voucher system, the protections “Obamacare” holds for sick children and uninsured adults could be repealed, and higher education opportunities would most likely be cut by his opponents. Obama pushed that this election is a choice between two vastly different ways forward. Obama has to make this election a choice between visions rather than a referendum on the economy to win because in the back of his mind, while he was giving the acceptance speech, was a disappointing jobs report. The convention put on by the DNC was well produced and well directed. The Democrats put on a show that was unified, on message and totally behind President Obama. They set the stage as best they could for the serious tone of Obama’s acceptance speech as he sought to recast his role before the American people. President Obama is now what screen writers would call a dynamic character, one who changed or evolved in some manner but as the August jobs report reminds voters this “ain’t a movie” – This election is about jobs and the economy. Why Didn’t Paul Ryan Fight to Save the GM Plant in Janesville? People put their hopes and dreams into politics because politics is a forward looking vision and we all want to be on the best path going into the future. But arguments for the future should not be based on misrepresentations of the past. Recently, the Republican national Committee put on a fairly good convention showcasing a series of Romney supporters and future leaders of the party. The Republicans put out their best and brightest and made their case for the future. Ann Romney and Marco Rubio stood out at the convention and gave grand slam speeches that pulled you into their lives and explained why they believe what they believe and why they believe Mitt Romney is the better choice in this upcoming presidential election. Mitt Romney did a fairly good job at “humanizing” himself which was the bar he had to get over. Romney did a fine job. He didn’t need to swing for the fences he just needed to play it safe and he did that well. Clint Eastwood was something else and truly something to see. But when it comes to Paul Ryan’s speech exuberance turned into exaggeration. The Vice Presidential hopeful delivered a full throated and impassioned speech making his case for why Mitt Romney and himself would be the better choice going forward. The only problem with the speech is it was fallacious at times. Among the false accusations and misleading stands Mr. Ryan took were misrepresentation of a work requirement to receive federal welfare benefits and a half-truth of Ryan’s support of the Simpson-Bowles deficit commission’s suggestions. But nothing was more contentious as Ryan’s assertion that a General Motors factory, that was shut down in Ryan’s hometown of Janesville, Wisconsin, was the president’s fault. According to Politifact The General Motors plant in contention was built in 1918 and has produced tractors for farming, automobiles commuting, and army tanks for war but most importantly that factory produced well-paying middle class jobs for Americans. That factory produced the American Dream – A means to owning a home, raising a family, sending your children to college, and retiring with dignity and security. In essence Ryan was pinning the crumbling American Dream on the President and using the Janesville plant as a metaphor. Which would be fair play except for the fact that that plant began closing before President Obama took office and was running a skeleton crew filling the last orders for light duty trucks when Obama assumed office. Ryan laid the responsibility for the plant’s closing and subsequent jobs loses on Obama because in 2008 the then Senator Obama visited the Janesville plant while campaigning for president. And this is the basis for Ryan’s fallacious claim: Because Senator Obama believed if the government was there to support the auto industry in 2008 that plant would be there for another hundred years. Mr. Ryan was part of the government in 2008 and was the congressional representative for Janesville during that year. Why didn’t Mr. Ryan use the government to support the workers of Janesville and fight for the funds to retool and retrain the workers of his hometown’s GM factory? If Ryan cares so much about auto workers now why didn’t care about them in 2008? As president, Obama did fight for the future of the auto industry and auto workers. President Obama battled against Republican opposition and against Paul Ryan himself to save auto manufacturing in the Midwest. Obama pushed for a bail-out for the auto industry in 2009 and won and America won and American manufacturing won and auto workers won. But for all the efforts and struggles of the 2009 auto bail out it was too late to save the Janesville plant that produced its last Tahoe and laid off the majority of its work force on December 23, 2008. At the eight minute mark in the video below Congressman Ryan states in 2008 that the Janesville Plant will be closed by December 23rd. The video below is of the last Tahoe built in Janesville being raffled off by Fagan Chevrolet with a dated banner from December 23, 2008. Of this video Fagan Chevrolet wrote – We were lucky enough to have the last Chevrolet Tahoe built at the Janesville, WI assembly plant. Fagan Chevrolet Cadillac would like to thank all the workers that put their hard efforts in day in and day out to make these great vehicles. We sure will miss having G.M. here in Janesville.